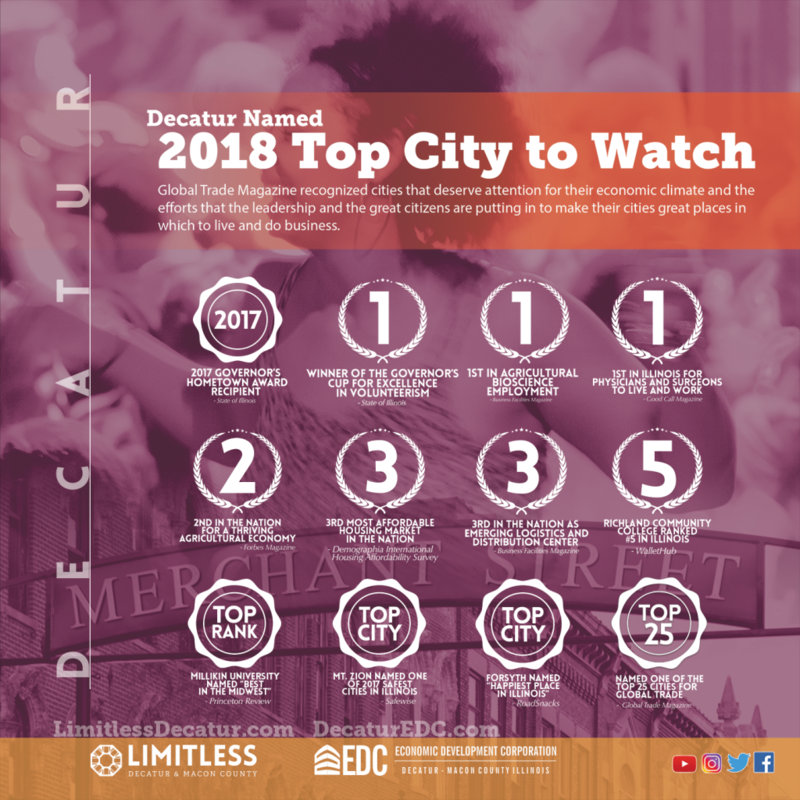 In addition to being named in the Top 100 Cities for Global Trade, Decatur was also highlighted as one of the “Cities to Watch.” According to the magazine, “These are cities that deserve attention for their economic climate and the efforts that the leadership and the great citizens are putting in to make their cities great places in which to live and do business.” Other cities included in the list are Madison, Wisconsin; Birmingham, Alabama; Irvine, California; and Baltimore, Maryland. Decatur consistently ranks at the top in the state of Illinois for export container origination according to the U.S. Customs declarations. Container movement into the Decatur region has increased in recent years thanks to the addition of the ADM Intermodal Ramp and its third-party capabilities. Business development efforts by the Economic Development Corporation of Decatur-Macon County and initiatives such as the Midwest Inland Port have brought renewed attention to the region, and additional recognition for industry and quality of life have helped shape the recent upturn in the local economy. The Decatur area’s recent rankings and recognition. The Economic Development Corporation of Decatur & Macon County is a nonprofit public-private partnership responsible for non-retail business attraction, expansion and retention efforts in Decatur & Macon County. Composed of a combination of leading private sector employers, labor, educational institutions and a variety of governmental bodies, the EDC is uniquely positioned to address the needs of Macon County’s existing business and employer base along with prospective businesses looking to locate in and around the Decatur, Illinois area. The EDC works with local, state and federal partners to provide economic, technical and training assistance to businesses in the Macon County area. Business Facilities Magazine’s 14th Annual Metro Rankings are in and the Decatur area received a first-place ranking in their Agricultural Bioscience Employment category. Their editors based their ranking on agricultural feedstock employment leaders from the 2018 BIO Report. The agricultural feedstock and industrial biosciences subsector applies life sciences knowledge, biochemistry and biotechnologies to the processing and production of agricultural goods as well as organic and agricultural chemicals. The subsector also includes activities around the production of biofuels and feedstocks for biobased polymers. Examples of such products include: corn and soybean oil, ethanol and biodiesel fuels, plastics and textiles synthesized from plant-based feedstock, and biobased ingredients for cosmetics, personal care products, flavors and fragrances. 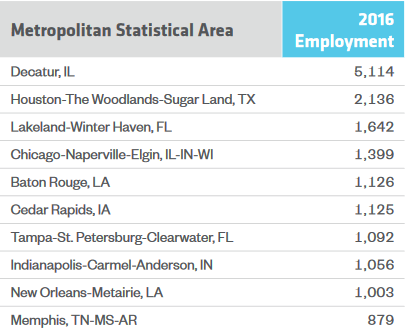 The Decatur Metropolitan Statistical Area (MSA) had twice the number of people employed in the feedstock and biosciences subsector compared to second-place finisher Houston, Texas and three times that of the Chicago MSA. Decatur is home to global companies like ADM and Tate & Lyle, and a broad-based network of ancillary and supporting businesses.